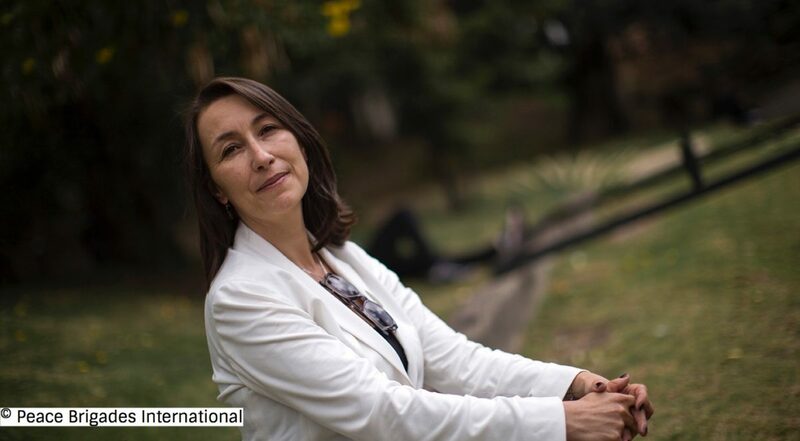 As the members of the Colombian Revolutionary Armed Forces (Fuerzas Revolucionarias de Colombia – FARC) are handing over all of their weapons, which was a key condition in last year’s peace accord, dedicated Colombian human rights lawyer Olga Silva urges international communities to ensure that this disarmament is more than merely symbolic. She talked to members of the Colombian Caravana UK Lawyers Groups on 26th June 2017 at the Law School at Queen Mary University of London as part of a wider speaker tour organised by Peace Brigades International (PBI). Although the peace accord between FARC and the Colombian government is undoubtedly a significant achievement, destabilising factors such as threats of extra-judicial violence and military incursions are ongoing. Olga currently works for Humanidad Vigente, dealing with strategic litigation following the repercussions of social and political conflicts, as well as issues surrounding impunity, defending territory and peace-building. Another important area of work is communications, as helping communities publicise their struggles continues to be a challenging enterprise. At Humanidad Vigente’s office in Bogota, the work they do is mostly regional, for instance in Arauca, Meta, Nariño, Huila and Magdalena Medio. Having grown up in the countryside, Olga witnessed first-hand the way that rural communities were marginalised and ignored by the state, a context which motivated her to protect the rights of the underprivileged. In regions formerly controlled by FARC, intra-family and domestic violence has increased, and women and children, the most marginalised groups, are being targeted she says. Olga is currently representing victims of extrajudicial executions, sexual violence (such as the infamous ‘Children of Tame’), displacement, massacres and threats of violence. In the campesino (peasant, small-scale farming) rural communities at Arauca, there is a lack of guerrilla armies but also a lack of recognisable authority. Part of the reason violence is endemic in this society is due to structural causes, such as poverty and lack of education. Olga therefore emphasises the importance of stabilising communities by teaching the men, women and children she works with to defend their own human rights. She is certain that brutal attacks on civilians are also happening elsewhere in the country, undocumented, which must be brought to light and publicised. Being a human rights lawyer is a dangerous profession in Colombia; common risks range from harassment to state violence. Women are particularly at risk, as references to their gender also commonly question their female integrity. There is also the risk of public defamation, for instance ex-President Uribe calling them ‘lawyers of terrorists’. This stigmatisation of human rights lawyers damages their credibility and curtails their ability to safeguard those they strive to protect. Attempts to delegitimise human rights lawyers are common: Olga tells us that just last Saturday, nine people, three of whom were human rights lawyers, were arrested in connection with a recent terrorist attack in Bogota. The detainees, all members of MRP (The People’s Revolutionary Movement rebel group) according to the authorities, have circulated a pamphlet on social media denying any involvement in the bombing or links with the rebel group. This is merely one example of the way in which activists are demonised in order to obstruct their work, and ultimately justice, and Olga stresses the fact that international co-operation is required to combat this. Humanidad Vigente has twenty-one years’ experience, but nothing could have prepared them for the onslaught of violent repercussions of publicising humanitarian concerns. In the first three months of 2017 alone, the organisation Somos Defensores estimates that 20 human rights defenders were killed in Colombia. This is also evidenced in the increased number of cases recorded by the Defensoria del Pueblo since since January 2016 to March 2017, in 14 months, 156 social leaders and human rights defenders have been killed; there have also been five forced disappearances, and 33 bomb attacks. Olga reports the frustrating fact that displacements, violence and even executions reported to the Fiscalia (Colombian Prosecution Service) rarely result in conviction. Olga highlights that paramilitaries have also been strengthened by new financing from narco-traffickers. In port cities such as Buenaventura and Tumaco, paramilitary structures are taking control and targeting young people, systematically getting them addicted to narcotic substances before introducing them to drug distribution and integrating them into gang culture. Part of the long-term aims of the peace agreement is to ensure non-repetition by purifying the state army, removing paramilitary presences and dissolving connections with narcotic institutions. However, this seems to have met with widespread resistance. A key element of the problem is that the relationship between paramilitaries and the government, once relatively transparent, is now obscured and concealed. Olga also stresses how the government currently denies the existence of the paramilitary groups, a strategy which services political elites, who oppose the reparation and land restitution processes, as well as effectively giving paramilitaries free reign to escalate acts of intimidation and violence. Colombian civil society denounces that paramilitaries are operating under a plethora of names – Bacrim (Bandas Criminales – Criminal Gangs), Post-demobilisation Groups, Neo-paramilitary Groups, Rastrojos, Urabeños – in order to obfuscate their identity, as they are determined to derail the end of the armed conflict. Olga says that the British government has followed Colombian state policy and uses the term ‘Bacrim’, as well as denying the existence of paramilitaries, which makes it harder to combat and dismantle. However, the peace accord mentions both ‘post-demobilised groups’ and ‘successor groups to paramilitary groups’, which suggests that there is a connection, and that labelling these groups as being paramilitaries might enable international communities to confront them more effectively. Further political instability lies ahead, as 2018 heralds both the presidential and parliamentary elections. Some political parties have already come forward to claim that they will shred the peace accord, or at the very least oppose Parts 1 and 2, the former regarding lands and the latter addressing political participation. Both points will prove to be vital, as both address the root causes of the conflict. The international community has a fundamental role to play in demanding the implementation of the peace accords. A crucial way in which Colombian Caravana members travelling to Colombia in 2018 can help is by continuing to question how the peace agreement is being implemented, how the security of communities and human rights defenders are being protected, and how the victims of state violence will be involved in the Special Jurisdiction for Peace. Mientras los miembros de las Fuerzas Revolucionarias de Colombia (FARC) están entregando todas sus armas, condición esencial del acuerdo de paz que se firmó el año pasado, la abogada colombiana de derechos humanos Olga Silva insta a la comunidad internacional a apoyar el proceso de paz en Colombia, tanto en lo que tiene que ver con el acuerdo de paz suscrito por el Gobierno y las FARC-EP, como el proceso de diálogo que se desarrolla en Quito con la guerrilla del ELN, como el proceso que aseguren que este desarme no es meramente simbólico. Olga habló con los miembros de la Colombian Caravana UK Lawyers Group (Caravana Colombiana de Juristas del Reino Unido) el 26 de junio de 2017 en la Facultad de Derecho de la Universidad Queen Mary de Londres como parte de una gira más amplia organizada por Peace Brigades International (Brigadas de Paz Internacional – PBI). Aunque el acuerdo de paz entre las FARC y el gobierno colombiano es sin duda supone un logro significativo, los factores desestabilizadores como las amenazas de violencia extrajudicial y las incursiones militares continúan. Olga actualmente trabaja para Humanidad Vigente, cuya labor se centra en litigios estratégicos derivados de las repercusiones de los conflictos sociales y políticos, así como en temas relacionados con la impunidad, la defensa del territorio y la consolidación de la paz. Otra área importante de trabajo son las comunicaciones, ya que ayudar a las comunidades a visibilizar sus luchas sigue siendo una labor desafiante. En la oficina de Humanidad Vigente en Bogotá, el trabajo que realizan es mayoritariamente regional, como por ejemplo en Arauca, Meta, Nariño, Huila, el Magdalena Medio. Habiendo crecido en el campo, Olga fue testigo en primera persona de la manera en que las comunidades rurales han sido marginadas e ignoradas por el Estado, contexto que la motivó a proteger los derechos de los menos privilegiados. En las regiones anteriormente controladas por las FARC, la violencia intrafamiliar y doméstica ha aumentado, y las mujeres y los niños, los grupos más marginados, están siendo atacados. Olga representa actualmente a víctimas de ejecuciones extrajudiciales, violencia sexual (como los conocimos ‘Niños de Tame’), desplazamientos, masacres y amenazas de violencia. En las comunidades campesinas de Arauca, faltan ejércitos guerrilleros, pero también falta una autoridad reconocible. Parte de la razón por la que la violencia es endémica en esta sociedad se debe a causas estructurales, como la pobreza y la falta de educación. Por lo tanto, Olga hace hincapié en la importancia de estabilizar las comunidades enseñando a los hombres, mujeres y niños con los que trabaja para defender sus propios derechos humanos. Ésta asegura que también se están produciendo brutales ataques contra civiles en otras partes del país, indocumentados, que deben sacarse a la luz y dar a conocer. Ser abogado de derechos humanos es una profesión peligrosa en Colombia, los riesgos comunes van desde el acoso a la violencia estatal. Las mujeres están particularmente en riesgo, ya que las referencias a su género también comúnmente cuestionan su integridad femenina. También existe el riesgo de difamación pública, por ejemplo, el ex presidente Uribe llamándolos “abogados de terroristas”. Esta estigmatización de los abogados de derechos humanos perjudica su credibilidad y reduce su capacidad de salvaguardar a aquellos a quienes se esfuerzan por proteger. Los intentos de deslegitimar a los abogados de derechos humanos son comunes. Nos cuenta Olga que el sábado pasado nueve personas, tres de las cuales eran abogados de derechos humanos, fueron arrestadas en relación con un reciente ataque terrorista en Bogotá. Los detenidos, todos miembros del MRP (Movimiento Revolucionario del Pueblo), según las autoridades, han distribuido un folleto sobre las redes sociales que niega cualquier participación en el bombardeo o vínculos con el grupo rebelde. Este es sólo un ejemplo de la forma en que los activistas son demonizados para obstaculizar su trabajo y, en última instancia, la justicia, y Olga insiste en el hecho de que la cooperación internacional es necesaria para combatir esto. Humanidad Vigente tiene veintiún años de experiencia, pero nada pudo haberlos preparado para el ataque de violentas repercusiones de la divulgación de preocupaciones humanitarias. En los primeros tres meses del 2017, la organización Somos Defensores estima que 20 defensores de los derechos humanos fueron asesinados en Colombia. Esto también se evidencia en el aumento del número de casos registrados por la Defensoría del Pueblo desde enero 2016 hasta marzo 2017, en 14 meses, 156 líderes sociales y defensores de los derechos humanos han sido asesinados; También se han producido cinco desapariciones forzadas y 33 ataques con bombas. Olga reporta el frustrante hecho de que los desplazamientos, la violencia e incluso las ejecuciones denunciadas a la Fiscalía rara vez resultan en condenas. Olga destaca que los paramilitares también han sido fortalecidos por el nuevo financiamiento de narcotraficantes. En ciudades portuarias como Buenaventura y Tumaco, las estructuras paramilitares están tomando el control y dirigiéndose a los jóvenes, haciéndolos sistemáticamente adictos a sustancias narcóticas antes de introducirlos en la distribución de drogas e integrarlos en la cultura de pandillas. Parte de los objetivos a largo plazo del acuerdo de paz es asegurar la no repetición depurando al ejército estatal, eliminando las presencias paramilitares y disolviendo las conexiones con los narcotraficantes. Una mayor inestabilidad política está por venir, ya que el 2018 anuncia las elecciones presidenciales y parlamentarias. Algunos partidos políticos se han manifestado en contra del acuerdo de paz suscrito, o por lo menos se oponen a las partes 1 y 2, la primera con respecto a las tierras y la segunda a la participación política. Ambos puntos resultarán vitales, ya que ambos abordan las causas profundas del conflicto. La comunidad internacional tiene un papel fundamental que desempeñar en la exigencia de la aplicación de los acuerdos de paz. Una forma crucial en que los miembros de la Caravana Colombiana que viajen a Colombia en el 2018 es continuar cuestionando cómo se está implementando el acuerdo de paz, cómo se protege la seguridad de las comunidades y los defensores de los derechos humanos y cómo las víctimas de la violencia estatal se integran en la Jurisdicción Especial para la Paz.